Joel Poinsett: Is He Worthy Of A Protest? If you are new to Greenville, chances are that you have asked someone how to spell “Poinsett.” With my office located on Poinsett Street in Greer, I am asked the question weekly. Beyond that, newcomers know about the Poinsett Hotel and maybe little else. As a way of introduction, Joel Poinsett was a Charleston native who spent his summers in Greenville during the early 1800’s. If you want to know what he looked like, the city of Greenville unveiled a bronze statue honoring him in 2001 during the annual Christmas parade downtown. The statue sits near the then newly renovated Poinsett Hotel. Longtime Greenville city and county residents can’t escape Poinsett. Along with the Poinsett Hotel, we have a Poinsett Club for members only, a Poinsett Road for everyone to drive on, a Poinsett Street in Greer where my office is located, red or white Poinsettias at Christmas, a gothic stone Poinsett Bridge in northern Greenville county and a good number of businesses that bear his name. Did Joel Poinsett really live up to his epitaph or did the city just sprinkle some historical glitter near the newly renovated hotel to impress the tourist trade? Upon inspection, Poinsett’s accomplishments and influence are vast. Educated in England, he spoke English, German, French, Spanish, Italian and Russian. He was a phyiscian, diplomat, botanist, road builder, Member of the South Carolina House, Member of Congress, Secretary of War. He established what was to become the Smithsonian Institution. He was an internationalist who understood the global cotton and textile trade war between the United States and Great Britain. Poinsett pushed for US territorial expansion into the Carribean after Britain emancipated their slaves in the islands and moved their cotton production to a different forced labor system in India. Typical British hypocrisy. Poinsett was a firm supporter of the United States slave system and opposed Britain’s attempts to disrupt the slave systems in Central and South America. He had travelled widely throughout his life and as a young man, spent weeks in Russia as a guest of Czar Alexander I, touring Russian cotton mills and educating the Czar on the slave system in the United States. 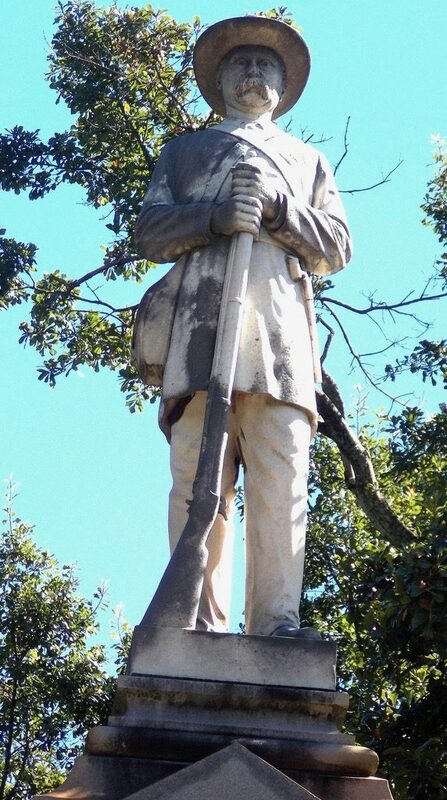 Now compare the tourist friendly Poinsett statue to the Confederate soldier’s monument on North Main beside the gated entrance to Springwood Cemetery. Apparently, a peaceful protest has been planned at the monument today to demand that the anonymous Confederate soldier be taken down. No word from the protestors about the graves of Confederate veterans in Springwood cemetery. Will they demand disinterment of the remains or will the removal of gravestones be enough? If they melt down the Confederate cannon at the monument will they beat the iron into ploughshares? They offer no solutions, just misdirection away from the failed socialist policies that they still support. Have your rising expectations not been met? Don’t blame Lyndon Johnson’s failed war on poverty. Are you behind on your student loans? Don’t blame Congress’ frequent manipulation of the student loan program. Does your family suffer from drug abuse? Don’t blame Richard Nixon’s failed war on drugs. Are you the college graduate who can’t get a job? Don’t blame the economic policies and corruption under Clinton, Bush and Obama. Just tear down the Confederate monuments. 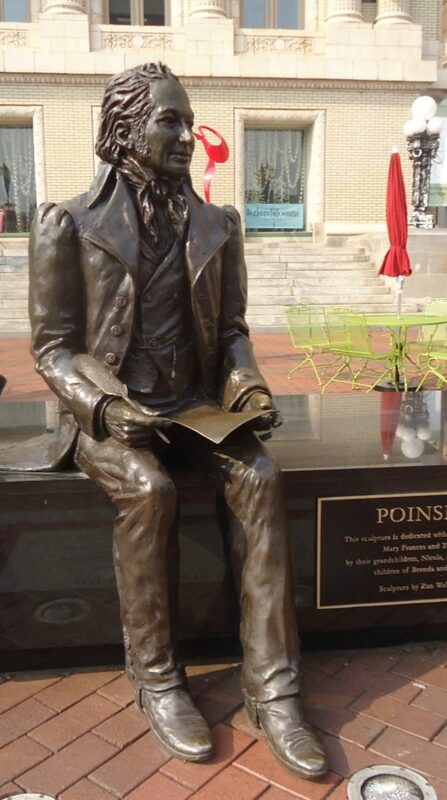 No such protest has been planned at the Joel Poinsett statue, either because Poinsett wasn’t a Confederate – the word that guarantees a media flashpoint soaked in hysteria – or the protestors just think he built the hotel that bears his name. My dad was a habitual watcher of the evening news. I remember him on multiple occasions repeating the same remark about protestors. In those days they were usually middle eastern men holding shoes or rifles in the air and being led by Yasser Arafat, a person that my dad had absolutely no use for. The remark was always: “If these people had to get jobs, they wouldn’t have time to protest. Somebody’s tax money is keeping them up.” A true statement on so many levels. Monuments don’t kill the job market. Bad economic policies do and our elected leaders have enacted many bad policies since the 1960’s. Tearing down Confederate monuments won’t solve our current problems. Dismantling the bankrupt socialist policies that started with Lyndon Johnson would be a good first step to restoring opportunity for everyone. For the record, if anybody is wondering, I say leave the Confederate soldier’s monument in peace and let Joel Poinsett remain a friendly pigeon roost. To start, I must state that, I am opposed to slavery, but these statues in NO WAY offend me. Simply put, one must put themselves into the time frame of the issue. Different TIME, different life rules. And, very importantly, in this, our current time frame, THERE IS NO OUTRAGE FOR THE VAST SLAVERY SYSTEMS THAT EXISTS AROUND THE WORLD. All through history, slavery has been a mainstay. To any victor, the spoils of war, including the concurred people, were their prize. Though this worked, as a system, until approximately 225+ years ago, now we have NO NEED FOR IT and IT IS WRONG. The USA is the leader in the destruction of the slavery system, as our Civil War added its abolishment to its outcome. And this was good. Many parts of the world did follow suit. Putting our selves into today’s time frame, Slavery is wrong, but the destruction of any past items, including Street Names, Statues, etc., serves no purpose, except to hide/shield one from the past, and its outcomes. Al this can do is make people FORGET THE PAST, and then, as the saying goes, WE ARE DOOMED TO REPEAT IT. This is one of the main reasons why Jews, after WW2, do not want the Concentration Camps destroyed. Plus it is their reasoning to also create Monuments to the Victims. No matter how BAD an event, or how GOOD an event, what they TEACH US is what is important. And these educational items, therefore HELP US GROW INTO BETTER PEOPLE. Nothing about the past, HISTORY, should ever be DESTROYED, HIDDEN, or PUT AWAY.